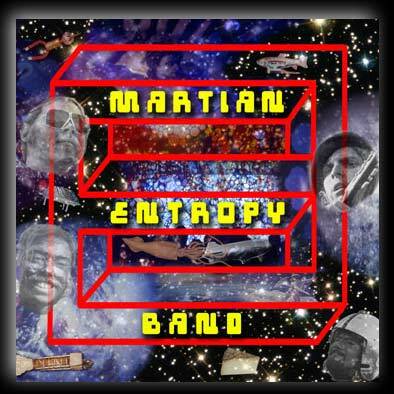 "the blimp" "boogie like a squid"
Somehow or other you have journeyed through space and time to arrive at the official website of the Martian Entropy Band. 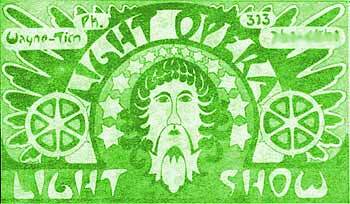 The band was active during the early mid 1970s in Ann Arbor, Michigan. Our mission? to blindingly glow where very few bands had gone before. The slideshow you are viewing consists of archival photos from the Ann Arbor Ozone parade from two different years: 1973 and 1974. The band was strapped on the back of a flatbed truck hauling a generator in each instance. The music you are listening to is one of the Ann Arbor Free Concerts, recorded in August 1974. The track is all the way live, as recorded. The left channel was a microphone on stage and the right channel was a direct feed from the PA. The master of ceremonies for the band was the incomparable Spaceman Bassman, none other than Mike Gould of mondodyne.com. On lead guitar and vocals was the amazing Timothy Prosser. On drums was the indefatigably smooth Bill Gracie. On moog synthesizer, farfisa organ and lead guitar was a 16 year old Hugh Jarvis Hitchcock. The majority of the music the band played was original. Long, hard hours of practice went into each and every original tune. Packed between soulful original blues and boogie and, one could say, a precursor to rap in the form of the song "Trouble", were others more challenging in the form of Zappa- and Mahavishnu-inspired pieces, with odd time signatures and unconventional tonalities. The band's only limitation was lack of equipment, and gigs, heh heh... being a bit ahead of its time, the band was lauded as an oddity... they did keep busy playing private parties, free concerts, downtown parades, and Star Trek conventions 🙂 not to mention, innumerable events hosted at the "house of madness" where the band lived and practiced.